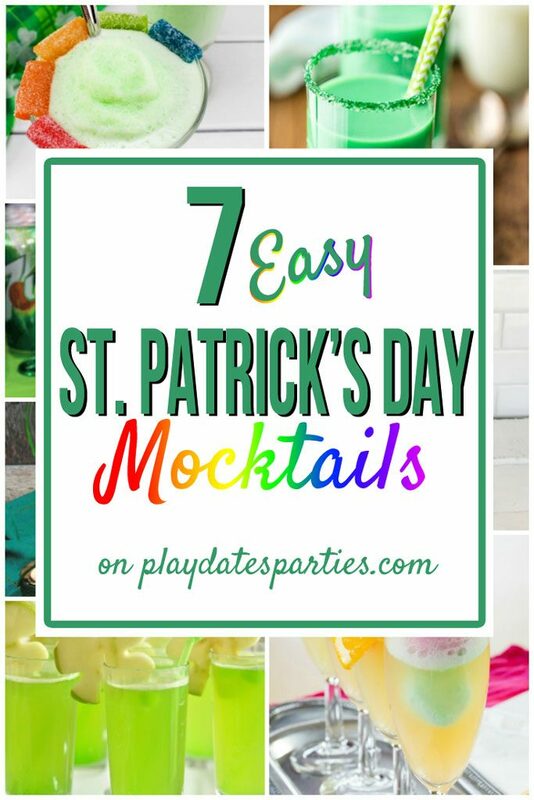 With rainbows, shamrock apples, & gold shimmer, these 7 easy St. Patrick’s Day Mocktails will help you and your kids celebrate in delicious style! Are you all ready to rock your green party hats for Saint Patrick’s Day tomorrow? We’re planning a day full of special treats for our little ones – but only in the best no muss, no fuss style. The morning will start off with their traditional bowl of Lucky Charms, then they’ll don a few green accessories for school. After school, it’s on to easy Saint Patrick’s Day treats and movie night. But since Saint Patrick’s Day is on Friday, I want to add a little something extra to our celebration. And making a few non-alcoholic ‘fancy’ drinks seems like the perfect way to make 7 and 4-year-old girls feel like they’re partying like the grown-ups! Here are a few ways to make your mocktails even more fun! How about making a quick Irish milkshake? That’s exactly what these Irish Frosties are from The Kennedy Adventures. The rainbow candies along the rim make a fun little colorful pop. 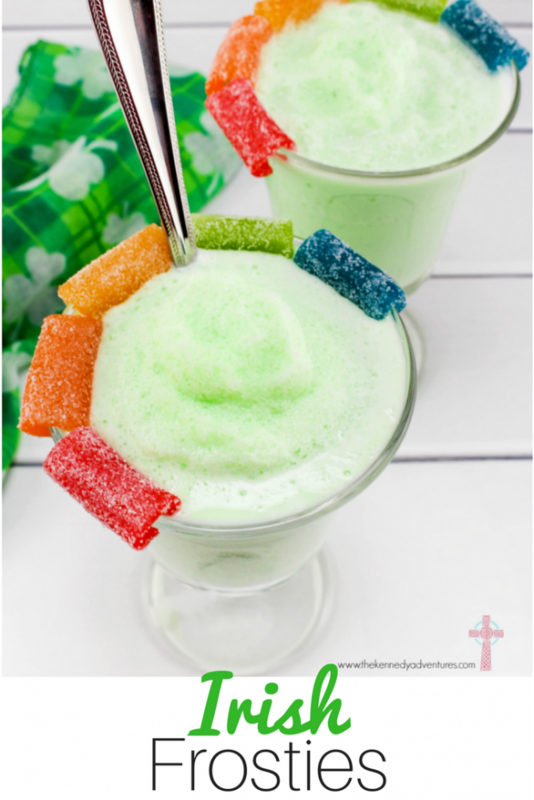 Dianna gets the kids involved in making the frosties and even includes a few ways to incorporate some learning about Saint Patrick. 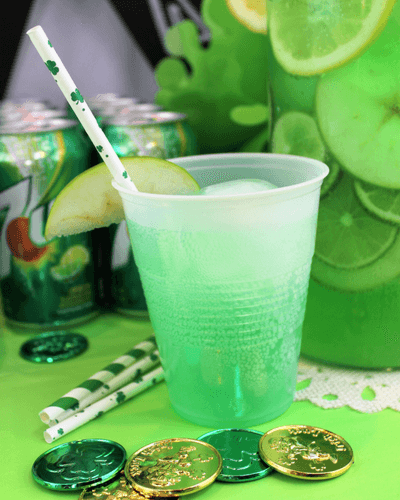 The pineapple juice in Spring Mount 6 Pack’s Saint Patrick’s Day Punch adds an unexpected tropical flavor to classic lemon and lime green drinks. The gold sanding sugar on the rim of the glasses is a fun little extra that kids of all ages will enjoy. My poor parents struggled to get me to drink a whole glass of milk when I was a kid. Making Leprechaun Milk (from the Cookie Rookie) might have made all the difference. The unusual combination of vanilla and mint is surprisingly delicious. If you haven’t tried it before, give it a shot this St. Patrick’s Day. 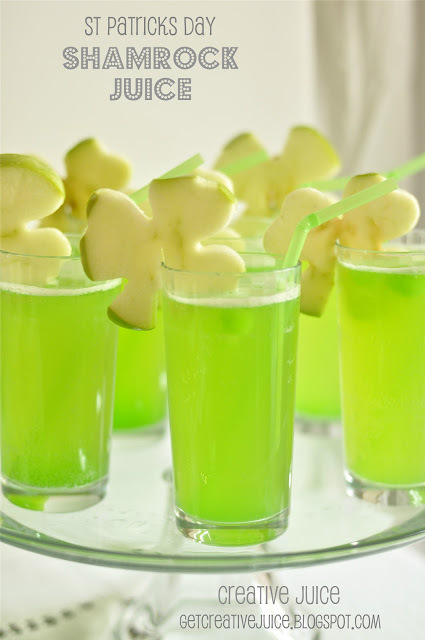 How clever are those shamrock apple slices?! But the creativity of this Shamrock Juice doesn’t end there. Kids will love knowing that this Shamrock Juice (by Creative Juice via Craft-o-Maniac) includes sparkling juice, in addition to a creative secret incredient…melted green popsicles! Simply Made Recipes shares possibly the easiest green drink you can find. 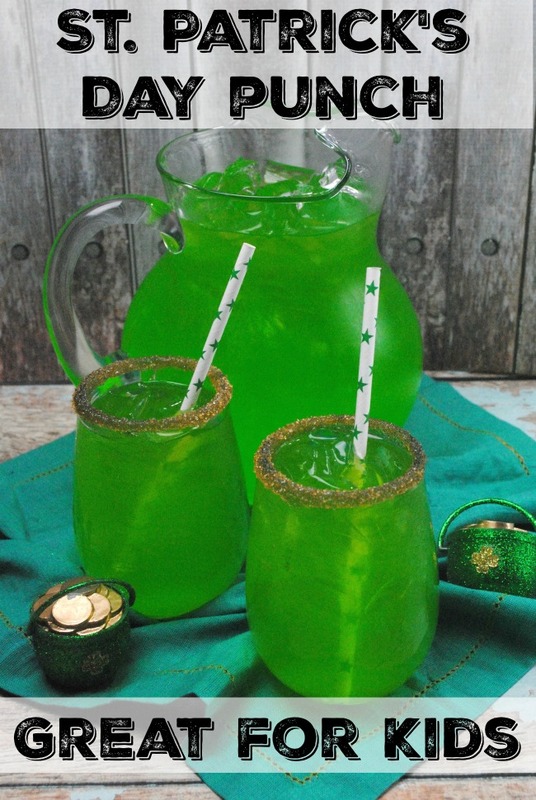 And not only does the post include these simple Saint Patrick’s Day Spritzers, it also includes recipes for green cupcakes and other fun party ideas. For bigger kids who like to feel like grown-ups, Cupcakes and Kale Chips’ Sparkling Cider Rainbow Sherbet Floats are guaranteed to be a hit. 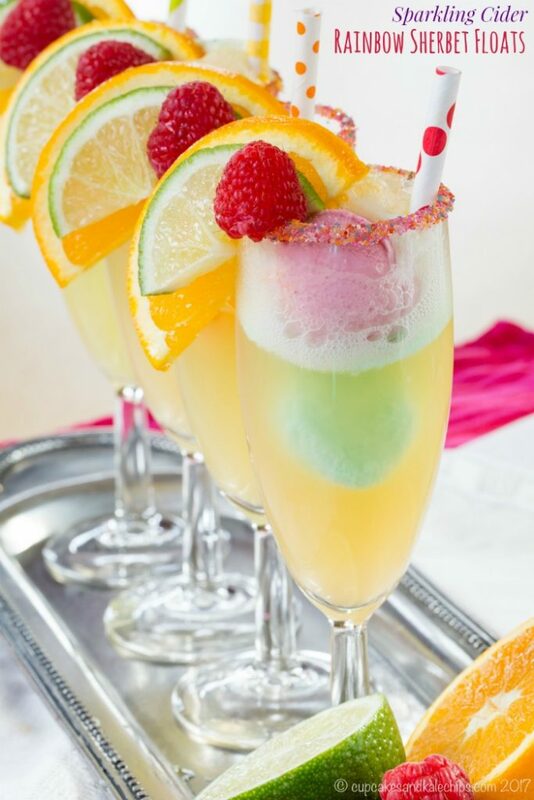 Seriously, who wouldn’t want to have those adorable itty bitty scoops of sherbet in a fancy champagne flute, topped with sparkling cider and fresh fruit? Now, for the biggest kids of all…us! 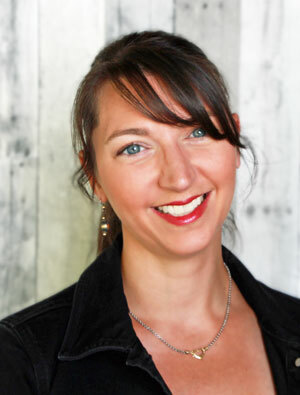 If you’re going dry this Saint Patrick’s Day, then you’ll definitely want to try out Virgin Mojitos by Clover Lane Blog. I probably would have enjoyed several of these a week if I’d known about them while I was pregnant with baby #3! 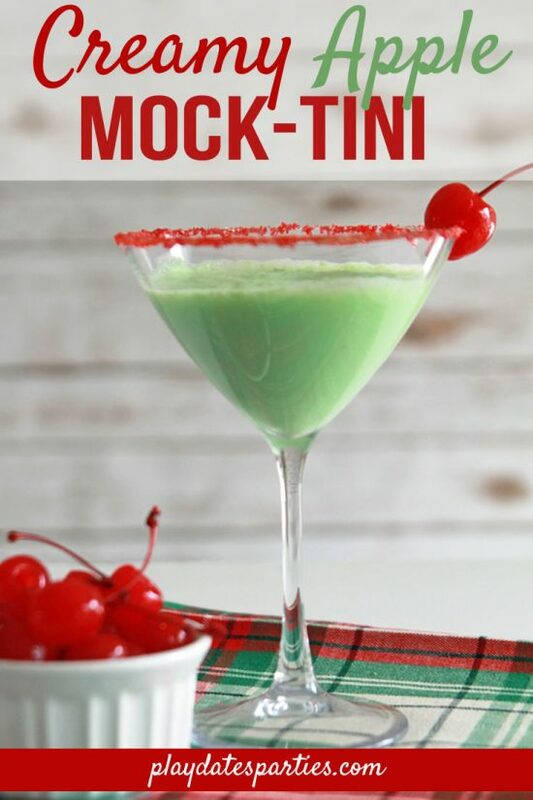 Whether you go for the green or prefer to ‘taste the rainbow,’ you still have time to pull off one of these St. Patrick’s Day mocktails for a fun evening in with the kids. But I want to know…. What are you doing this Saint Patrick’s Day? Which one of these St. Patrick’s Day mocktails would you like to try? These look awesome! We will have to try the rainbow sherbet float. My people would love that. Thanks for sharing :). Have I ever mentioned that I want to come to one of your parties someday?! I think you really know how to celebrate. These look fabulous! My daughter is too young for these drinks, but I may just have to make some of them for myself. 🙂 Thanks so much for the round-up! I am suddenly very parched looking at these photos. That rainbow sherbet is just too pretty to drink! Definitely hanging on to these. It may not be St. Patrick’s Day, but I see no reason not to enjoy these now too! These are also great for us grown ups that prefer not to drink a lot of alcohol. Thanks for sharing at the What’s for Dinner party. These sure do look fun and festive! Pinned. These drinks look refreshing and fun. 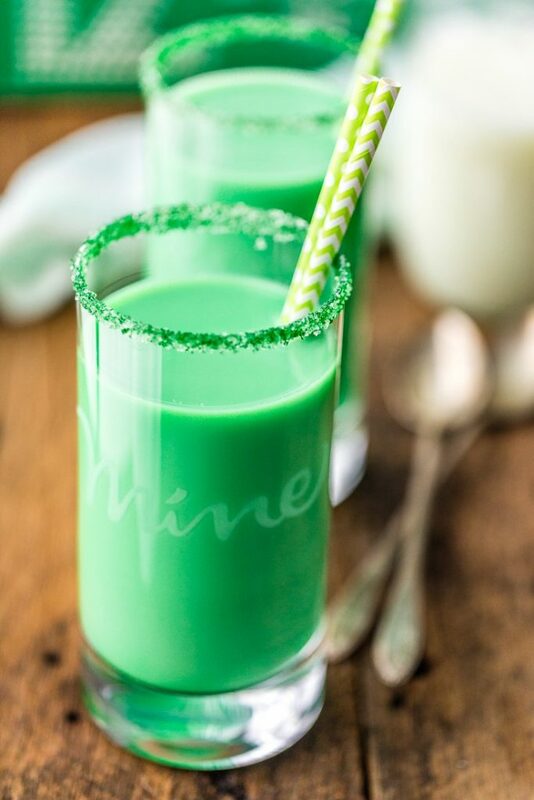 Thanks for sharing these St. Patrick’s Day drinks on Sunday’s Best. I love these, great ideas for the kids. Thank you for sharing at The Really Crafty Link Party. Pinned! I can’t believe we are already looking at St Patrick’s Day! Thanks for sharing at #BloggersPitStop. These ideas for Mocktails look great and you don’t need alcohol to have a good time. What a fun idea! Thanks for sharing in the To Grandma’s House We Go DIY, Crafts, Recipes and more link party! These are so cute!! Love them even for adults who can’t or don’t want to drink. So perfect for St. Patrick’s Day. Omg, my kids would love all of these! 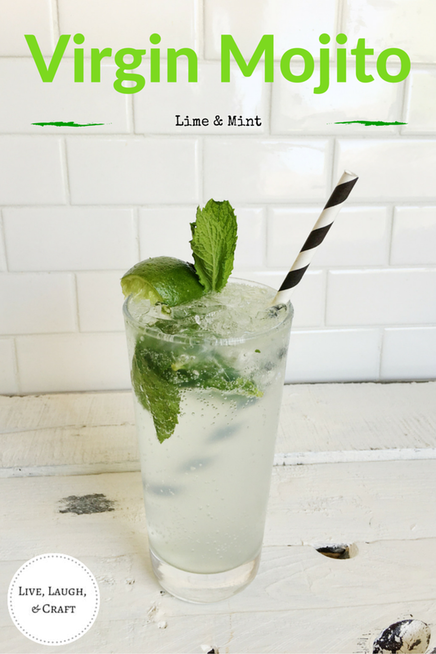 I’m going to make them a virgin mojito, and perhaps some regular ones for my husband and I to have too…. 😁 But wow! Some of them, I want lol! Very cool ideas I have to pin for later. My kids would love these fun drinks. You are right: kids would love these colorful drinks! Thanks for sharing at Fiesta Friday!